The Portuguese-speaking population, which includes primarily those from Continental Portugal, the Azores, Madeira, Cape Verde and Brazil is the largest ethnic group in the region. 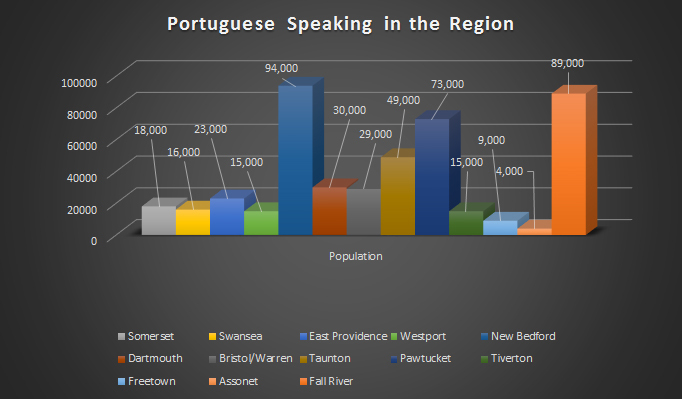 The Portuguese language is the second most spoken in Massachusetts and Rhode Island. In Massachusetts, the Portuguese-speaking population is concentrated mainly in the Bristol County with Fall River being the city with the largest numbers. The Portuguese-speaking is very influential ethnic group socially , culturally, politically and economically. The same can be said of the Portuguese-speaking population in Rhode Island. 10h-10.15h "Joao Luis de Medeiros"